21 Day Family Detox Rejuvenation Journey and Skin Repair Workshop – We have a beautiful 6 member family all coming together to participate in Hawaii to Reset, Detox and Rejuvenate themselves in a variety of ways. All I can say is: “BRAVO to the WHOLE FAMILY!” for all the courage and discipline it took to get them together for 21 days of detoxing and learning different approaches to live better. Hopefully, many other groups or families will be inspired to detox and rejuvenate your own families/friends, just like the “Frey” family of 6 did over the 21 days of their journeys. Part 1 ( 55 min ) – The Theme of this video series is “Family Detoxification and Rejuvenation”. Adam and India will tell you some of their profound detox and rejuvenation stories, and adventures in doing a 10-14 day steam distilled dry water fast, and they also had a myriad of health and wellness protocols with the entire family to follow and experience. We are going to find out how they all transformed through their 21 day family detox/rebuilding journey in Hawaii. Part 2 ( 111 min ) – “Removing Facial Wrinkles and Skin Fungus” with India ( daughter ) and Adam ( Dad ) of the Frey family will be a “REAL EYE OPENER” for sure. The theme is to rid the skin and pores of fungus, candida, parasites, wrinkles, scleroderma – hardening of the skin etc. for younger skin and older damaged skin. I call this level of parasites of the skin and pores “Category 1” Species or Class that live in the skin and pores. We have 10 classes/hierarchy of parasites creatures verified so far in our private lectures. Mom and Dad are in their 50’s and their 4 beautiful siblings/adults ranging from ages 20 to 29 years old. It is truly amazing for a family of 6 to go through all this together, and be able to get off work or have the time to spend for the whole 3 weeks with us. Again, I was so personally excited to have a group of 6 family members, all blood related, commit to this “Life Changing Event” in all of their lives. Adam Frey, and his 20 year old daughter India, and I had a lot of fun on the interview and hands on workshop, being cooked for over 2 hours in the sauna. Wait until you hear some of their fabulous detox and rejuvenation stories! Most of us have “Skin Fungus” and “Wrinkles” as we age for sure. Skin fungus, pore parasites and toxicity clog our skin from breathing and prevent toxins from leaving through the skin and pores. Skin and pore toxicity is a huge problem with many people and they do not know it. There is truly “Fungus alla Mungus” in 9 out of 10 people I have surveyed over many years of clinical practice. 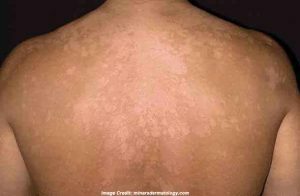 “Tinea versicolor (also known as dermatomycosis furfuracea, pityriasis versicolor, and tinea flava) is a condition characterized by a skin eruption on the trunk and proximal extremities. Recent research has shown that the majority of tinea versicolor is caused by the Malassezia globosa fungus, although Malassezia furfur is responsible for a small number of cases. These yeasts are normally found on the human skin and become troublesome only under certain circumstances, such as a warm and humid environment, although the exact conditions that cause initiation of the disease process are poorly understood. This is a weak definition, but it’s better than nothing. There are many forms of these fungus parasites and this is one of them. The detoxing or “Dissolving, Washing and Re-Nutrifying” the body and mind is why we are Block Fasting together at the same time, and go through this “Life Changing Event” correctly. We are wanting to release DE-accumulated toxicity, parasites, negative realities or any thing that is not needed to grow the body and mind to the next layer of “Enlightenment, Vitality, Evolution or Grade School”. Recommended Courses/Categories: Becoming Your Own Doctor, Skin Cleaning, Detoxification and Rejuvenation, How To Make Super Mineralized Sole Salt and Delousing, Detoxing, and Sanitizing Hair and Skin Parasites. These cutting edge Terrain Modification protocols will help you detox, wash, remove, re-nutrify and regenerate skin and pores, as they have done for tens of thousands of people before you who have practiced these protocols. This is a “Medically Supervised Dry Water Fast” – So, we have 3 Naturopathic Medical Doctors ( NMD’s ) to supervise the Distilled Water Fast/Terrain Modification protocols. The premise for our Detox Hawaiian Vacation for yourself: Follow the protocols and do what you can, and as much as you can safely handle for your various levels of health and abilities etc. Learning the protocols with a hands on approach is the best way to easily learn and practice a lot of the Earther Academy protocols, practices and principles that we offer, while you are detoxifying and rejuvenating your mind and body. We also have 2 full time seasoned interns, that have already gone through all of the 21 day protocols on other retreats, to help teach and help with the many workshops that we have in the 21 days action. Before using any of the Terrain Modification skin and pore protocols please watch several of the courses we have first. Learn to make the Vodka Skin Cleaning Solution here. Re-lubricating and protecting with the optimal products necessary are all available at a discount from Earth Shift Products. Please watch the many protocols of many private skin and sauna videos to make sure you are learning efficiently and smart. See what happens to you when you really detox and rid the skin of fungus, yeast, mold, parasites etc. The “Tinea Versicolor” Parasite or Fungus as many call, it is easy seen under fluorescence using a “Wood’s Lamp” or “Real Black Light”. They show these creatures very easily shine on the skin in the dark where they are hiding on your skin super invisible. I have realized from personal clinical examination on 1000’s of patient’s skin and pores that 9 out of 10 people have some form of fungus, and or many other creatures that live on the skin and pores. Most of these skin and pore parasitic creatures are embedded into the dermal layers so a bath or showering with soap really doesn’t help to much. There are literally 1000’s of known and unknown species of skin/pore parasites/creatures or toxicity conditions to consider removing and sanitizing. Learning the cutting edge all natural Terrain Modification protocols, practices and principles are the true personal antidote to these elusive parasites/creatures that invade all of our skin and pores. The pictures in this course are of the “Tinea Versicolor Skin Fungus Parasite”. The parasite is seen very easily with a special “Black Light” or what is called a “Wood’s Light” to used to illuminate them when turned on in a dark room. This way you can see them more easily if the person does not have a deep tan, and this parasite is invisible most of the time to the naked eye hiding on the skin and pores. Most people have no idea they have these very common elusive skin/pore parasites and/or fungus unless you use black light or you become very tanned by the sun. So, please follow the life changing “Terrain Modification protocols, practices and principles, and learn how to feed you body through it’s skin with ionic trace minerals and sanitize, detoxify, rejuvenate and relubricate your skin and pores.